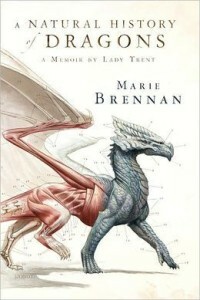 When I first saw the cover of A Natural History of Dragons, I knew I was going to love the book. (I know the adage about not judging a book by its cover, but come on, it’s gorgeous!) 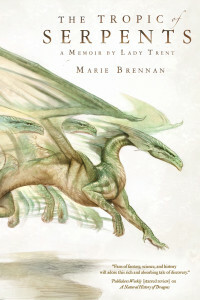 The book blurb only furthered that impression – a Victorian-style memoir by Lady Trent, who has defied convention to follow her passion and become the leading dragon naturalist of her day. Isabella has been fascinated with the natural world (but especially the dragon family) ever since her cook taught her how to preserve sparklings in vinegar when she was seven. She knows that this hobby can only ever be a passing fancy for a lady of her station, but as luck would have it, she has the opportunity to travel to the mountains of Vystrana on a scientific expedition to study their fabled rock-wyrms. This journey, of course, turns out to be far more arduous than Isabella imagined it would be – involving not just inflamed dragons but complex politics, vengeful gods, and exhilarating discoveries. Given this premise and that beautiful cover, I had really high expectations for the book, and they ended up being comfortably exceeded. Isabella is a fantastic protagonist – she tries very hard to reconcile her natural curiosity with what’s expected of her, and although she doesn’t always succeed, it’s still endearing. She’s no rebel with a twenty-first century sense of morals and propriety; she’s a woman of her time that is just very passionate about scientifically studying dragons. A Natural History of Dragons also has a fascinating world. It is clearly based on 18th-19th century Earth, with Isabella’s homeland being analogous to England, and Vystrana similar to Eastern Europe. There are dragons, but they are just natural beasts – there is no “magic”; although the sense of wonder that Marie Brennan with new scientific discoveries is even better than magic. We learn a lot about the world through the political intrigue and the other mysteries in the book, like ancient ruins of a civilisation known as the Draconeans. Okay, I’m also supposed to be writing about the sequel as well, so I’m going to stop talking about A Natural History of Dragons now. In The Tropic of Serpents, it has been three years since the very eventful Vystrani expedition, and Isabella is far more confident in her abilities and far less concerned with what the world thinks of her. She jumps at the chance to go on an expedition to the continent of Eriga, home of many little-known varieties of dragons. However, Eriga makes her previous expedition look cushy – strange customs, warring countries (and more politics! ), oppressive weather, hundreds of killer species, the list goes on. All the elements that made the previous book such a success are still present in this one – Isabella continues to be awesome, the writing is beautiful, the worldbuilding is captivating. Eriga is an African analogue (except without as much rampant slavery/exploitation, I think), and there are many cool African-inspired things that this book explores, from stereotypical “big game” hunters to different views on gender and property ownership. This is not just a series for light, fun reading – Isabella faces some heavy moral dilemmas. She has changed a lot from the first book (mostly as a result of the events of that book) and her character growth is very different. She is not quite as wide-eyed and eager, but her curiosity and competence still make her very compelling. She also takes more of a direct role in events this time; instigating rather than reacting, and you can definitely see her along the path to evolving into the somewhat cantankerous older woman that she is in the forewords. I really enjoyed the supporting characters in this book; especially Natalie. It’s interesting to see Isabella’s choices already causing ripples in the freedom of other women, and Natalie had a great story arc from being the woman desperate to escape her expected place to society to becoming more mature and confident (all while inventing a glider!) I also loved the burgeoning respect and friendship between Isabella and Mr. Wilker. I don’t have much to say about the plot except that I do like how the plot always ends up being relevant to major scientific discoveries that Isabella makes. I wish we still lived in a time when science was a new frontier and enthusiasts could make new scientific discoveries and/or invent things easily (okay, I don’t actually, because modernity has its benefits, but these books really make me wistful). I’m terrible at endings, but I’m really excited to see what Isabella does next. If you made it this far, you might be interested in my interview with author Marie Brennan and giveaway of two sets of both these books. This entry was posted in Books, Reviews and tagged book 1, book 2, fantasy, fiction by Kriti Godey. Bookmark the permalink.